Is someone only now alerting media outlets about a threat incident between two Mason Ward candidates, that occurred weeks ago, because ballot papers have gone out? In what may seem a contentious Q, we consider it worth asking why, in what must have been a distressing time for all involved since the alleged incident occurred on 19 Sept, news of this is only coming out now – two newspapers, here and above, in four days? The incident we are referring to, of course, is that of the alleged threats made to Mr Frank Lanza’s welfare by the father of Ayse Martli (both are running for Mason Ward). 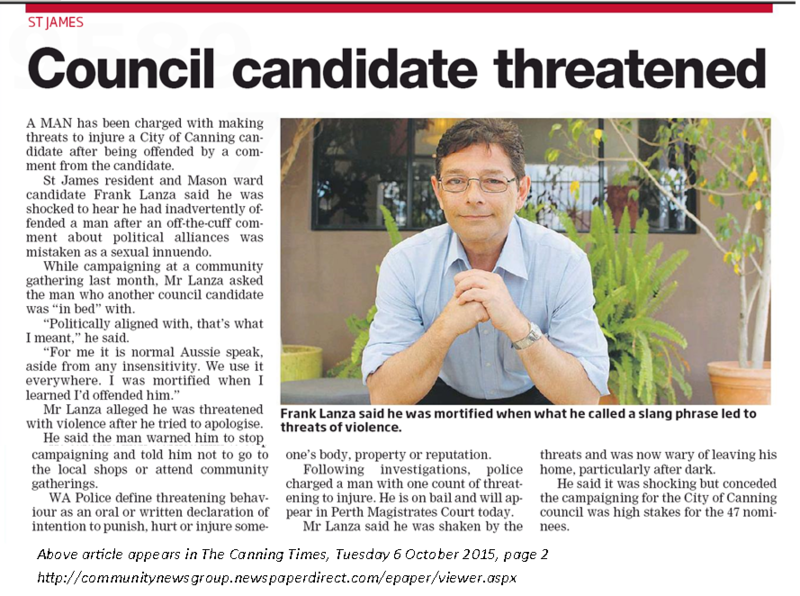 The basis of it all appears to be that Mr Lanza was campaigning amongst the multicultural community, which he has done for some time, when he allegedly made a culturally insensitive remark to Mr Martli, following his unwillingness to accept Mr Lanza’s campaign flyer. Mr Lanza, who we’ve often pointed out hasn’t shared his own extensive political party involvement as part of his campaign, is then said to have asked Ayse’s father who [his daughter] was “in bed with” – meaning, as Mr Lanza puts it, which political party is she involved with? People make mistakes (often in gest), others become offended, and it is obviously concerning Mr Lanza went on to feel threatened after he rang to apologise to Mr Martli for his behaviour – a threat the police took seriously and now the courts will resolve, although that may not occur before the end of the election period (Mr Martli will appear in court today, but may be remanded to another date). In the meantime, Ms Ayse Martli must surely find herself in a very difficult position – she can see that the incident between her father and Mr Lanza is suddenly appearing in newspapers, but is probably constrained on what she can say about it. There is no such reticence on Mr Lanza’s part, however, and there is still the issue of why is knowledge of an incident not generally found in the public arena, and weeks old, only now coming out as Mason Ward prepares to vote for its two new representatives?